Lucia Arca, 16 years old. I am the prime representative of all things ordinary, but by using the shabby magical incantation “Soap!” I can only cause soap bubbles to appear. Through this, I perform the duties of a laundry girl employed by the royal castle. I thought that this magic’s only effect was to clean dirt off from the washing. However, one day I found out it also has the additional effect of purifying monsters. And y’know, because of this it’s turned into a total disaster. The Heavenly Crystal Trees acts as the intermediary of all magic, and they are also the root of the monster outbreak. As I’m suddenly forced to accompany the journey to purify the Heavenly Crystal Tree, the companions joining me include His Highness the crown prince, a saint summoned from another world, the commander of the strongest knight brigade and his adjutant, the Dragonslayer Hero, the Academia institute’s top sorcerer, etc. etc. etc. With all the extraordinary people gathering together, I’m going to feel faint! I’m only ordinary! Surrounded by these prodigies, once the Heavenly Crystal Trees’ purification safely ends, my daily life will return to normal. Right…? So far so good. No ridiculousness of being too OP MC. MC is also quite humble, dopey, and most importantly FLOOFY! Ah, this story was nice while it lasted. It showed promise to be a fun read with the cutesy romance. And I was really anticipating seeing how the author would weaponize this rather really unique "Soap" skill that was only thought of as only useful for laundry. Unfortunately, the second translator said he got a Cease & Desist request, apparently so did the first translator, due to the author vying for a publishing deal. I went and read the raws on syosetu coz no translator would touch this anymore. 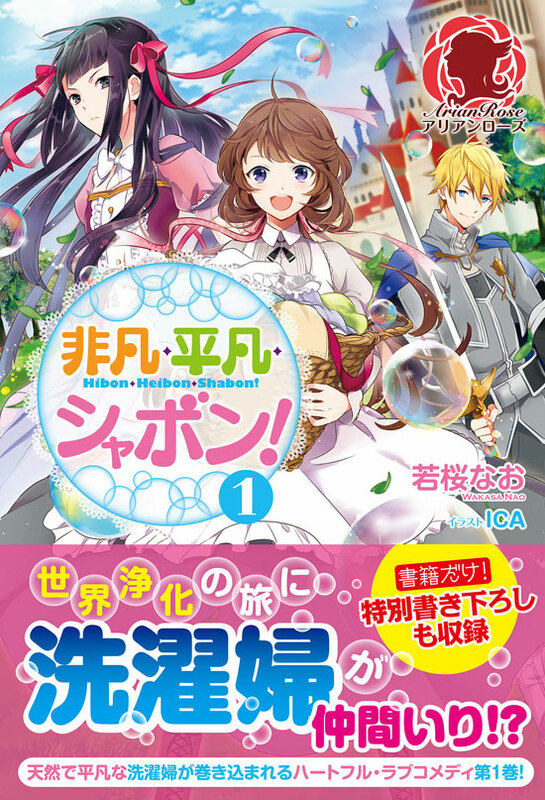 It's interesting due to the MC's ordinary but extraordinary power of conjuring soap bubbles. Not only supremely effective against the toughest stains, it also doubles as monster calming magic by washing away their aggression. Besides that we also have the dashing Celes-sama who has been pursuing the MC for months. MC is oblivious to his omg-so-cute attempts, and only regards him as a friend because she thinks he is way out of her league. Seeing the... more>> great Celes stutter and stumble around her is so moe! Gah, my heart! I love the extreme misunderstandings of this tale so far. The dopey heroine has an amazing gift, the ability to clean anything with her "soap" power. Though I haven't gotten there yet, apparently, this will extend to monsters as well. The romance is why I read this though. Even though the heroine doesn't have any clue how important the guy she meets with is, their interactions are still extremely moe! Adorably cute! You can't hate the heroine because she's just sweet and kind. Not in that overly sweet kind, but the normal one. She help other people, she befriend a knight, and she get scared too! It's nice when you got a normal MC with slight unique power. My reviews are more often than not sprinkled with hints of spoilers, but they aren't necessary spoiler explicit. Regardless, it's best if you skim through this review if you aren't caught up with the translations or if you want to enjoy this story with a blank slate of mind. This review will probably NOT be updated as it seems that the translations were asked to stop by the author herself. This is a floofy fuzzy story of fluff. The two characters that stands out are our main character, who can be described as generic in a likable way, and her love interest, who's also generic in a likable way. Set in a medieval type of world, you get to read this story through the eyes of a side character. The MC and her love interests are a sweet couple that makes you want to support and cheer for them. What makes the read so enjoyable are the character interactions and the writing itself; it's simple but calming to read. There's a small twist that may lead to a long story, but it seems we won't get to see how it'll turn out. No one said this was a harem. It seems like it'll be a cute and fluffy story from now on. The heroine is a bit dopey but she's earnest. The story is well paced but I urged to plot to move a bit faster for a reunion. The main love interest seems to be a earnest guy so far, he has a reputation but his persona makes his debut appearance all the more adorable. Nice fluffy sweet, I can't find enough words to describe it! But I perhaps have been reading way too many vilianess type novels but I am seriously wondering if the "saint" is a good friendly girl or a self entitled heroine... I hope I am wrong for Lucia's sake!